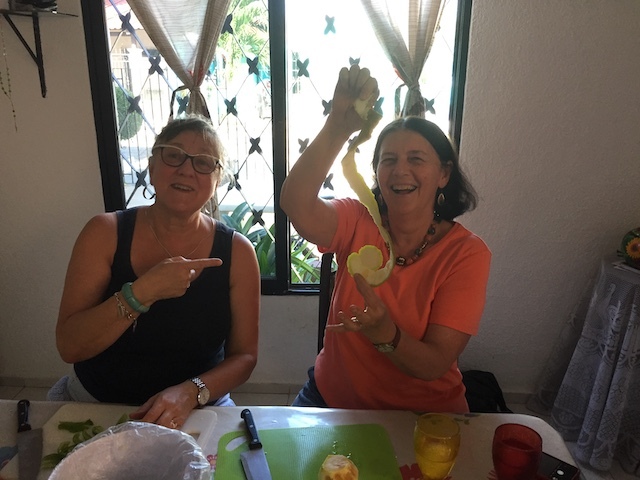 urban adventures cooking in merida | What Next? 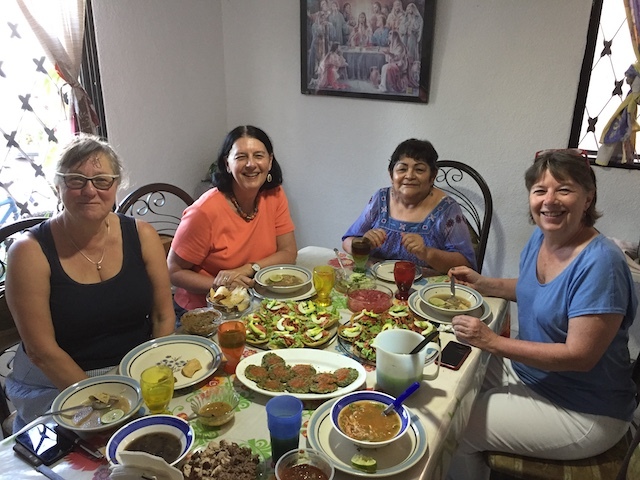 My sister Kaaren and I and our friend Deb went on a cooking adventure in Merida Mexico.This is the beautiful table of food we helped create. How did it happen? Well first we went on a shopping trip to a large neighbourhood market to gather the ingredients for our meal. I wrote about that part of our adventure in yesterday’s blog post. 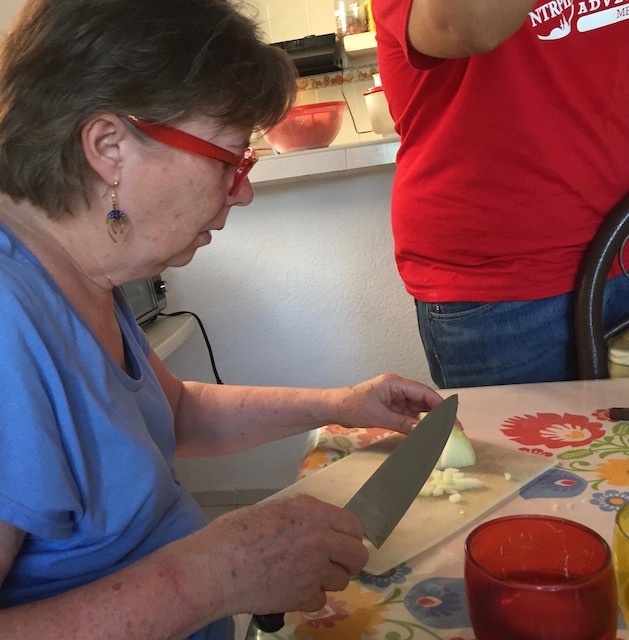 This lovely lady is Aunt Bertha and we were in her home for the cooking part of our adventure. 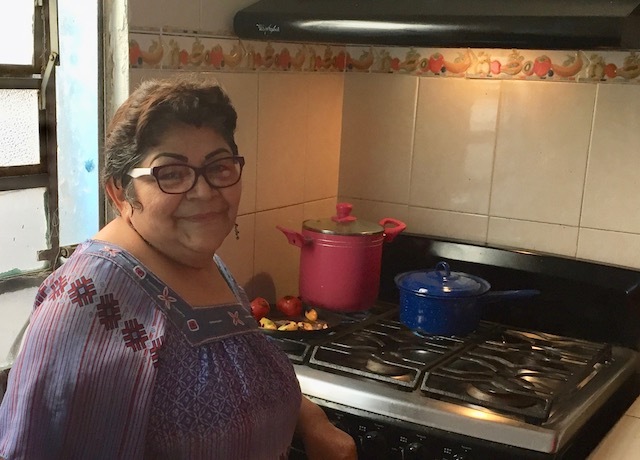 Bertha who used to be a cook for the public health department had pots bubbling on her stove when we arrived. One was for chicken. 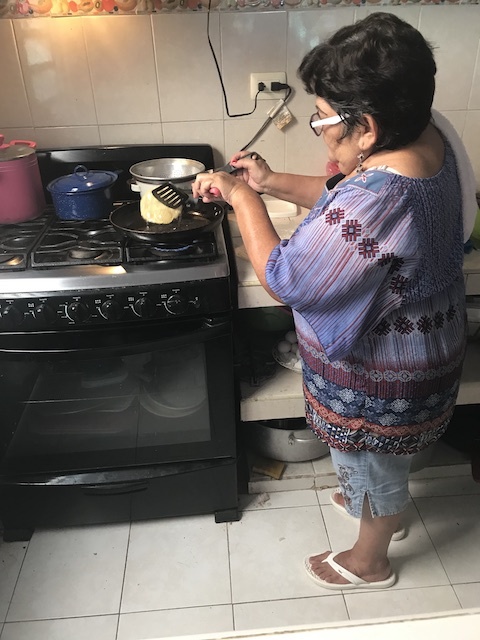 She was boiling it in water spiced with cinnamon and cloves. 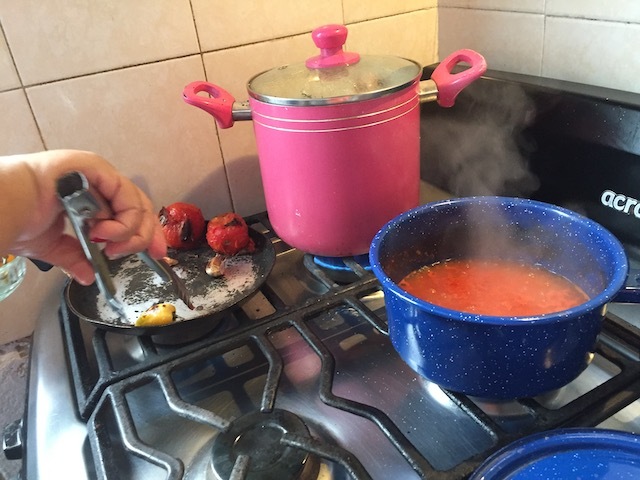 While Bertha roasted peppers and made a sauce with the tomatoes we had bought at the market, Edgar our guide for the day got the three of us right to work. 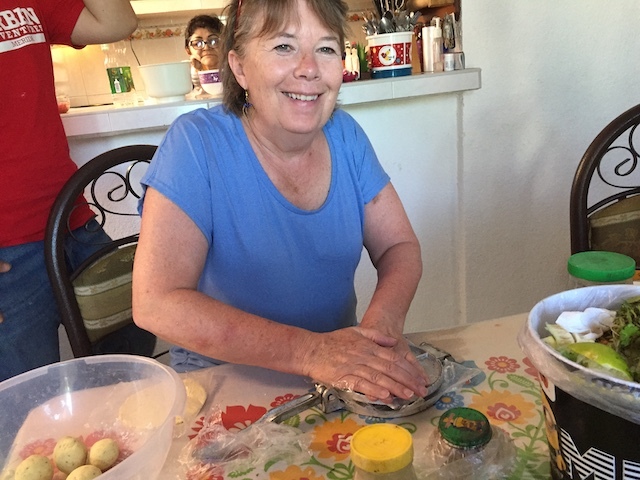 Deb cut up peppers and limes My sister Kaaren chopped onions and I was given the job of peeling oranges. 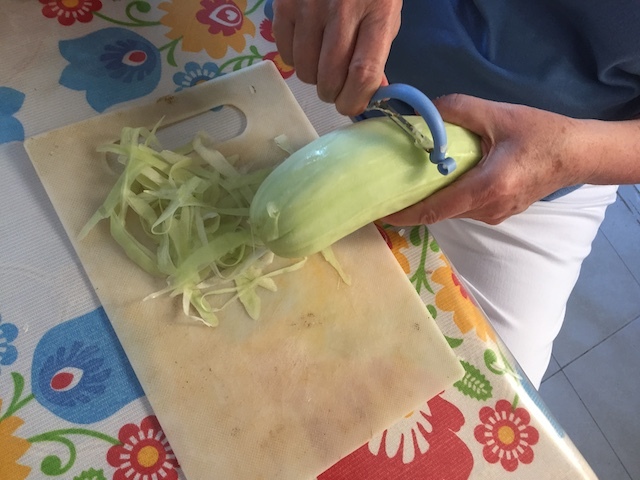 Edgar told me I needed to try to keep the peel in one piece as I removed it because for each time I created a perfect peel it would signal one marriage in my life. I managed to keep five orange peels whole but said I had no intention of being married more than once. Next I had squeeze the juice out of all those oranges with my hands. 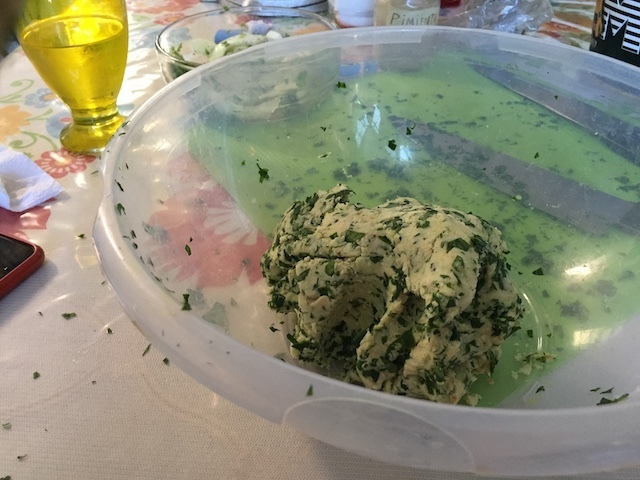 Edgar said we put our love into food when we touch it. 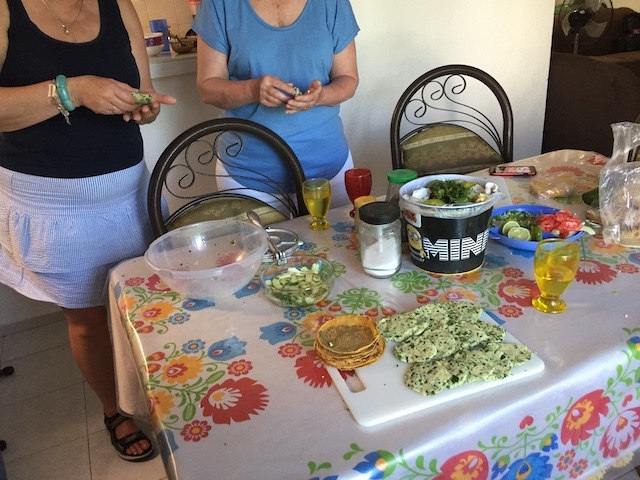 In the meantime my sister Kaaren was busy peeling cucumbers which would be cut into thin half-moon slices and marinated in coriander and lime juice. 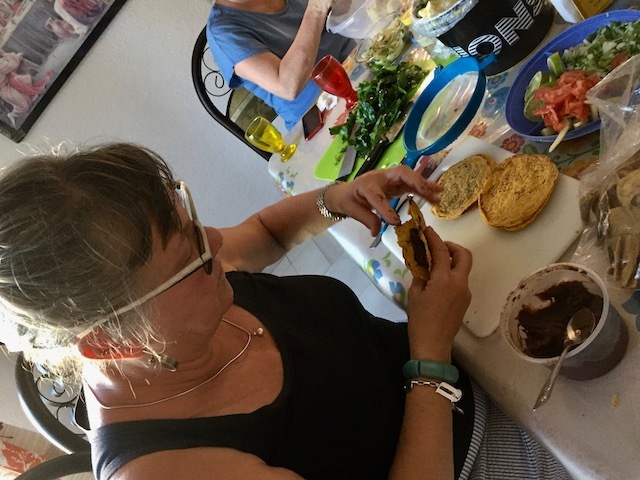 Deb was stuffing panuchos with black bean paste. 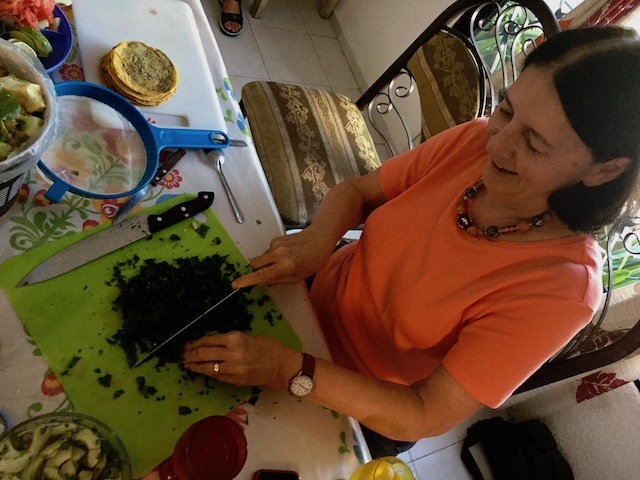 I got to work chopping chaya a leafy kind of spinach that would be made into a drink and used to flavor tortillas. 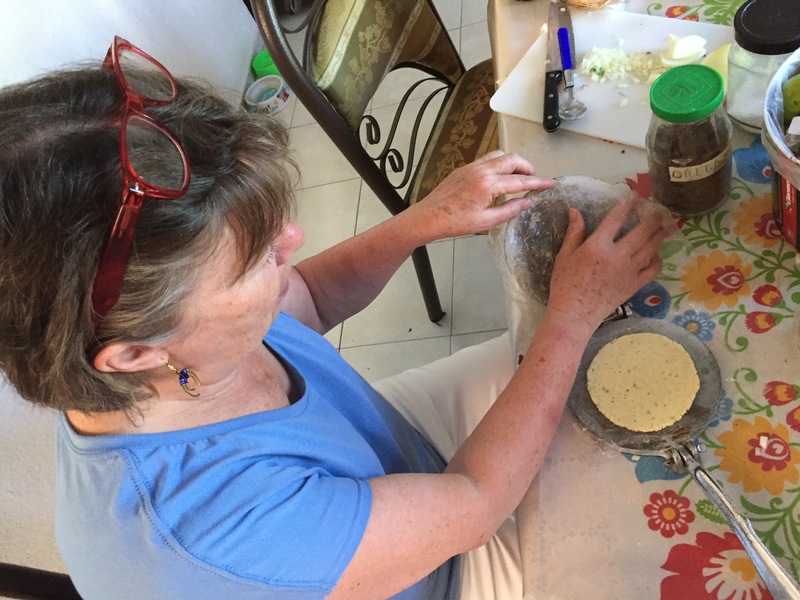 Kaaren was given a press to make tortillas. 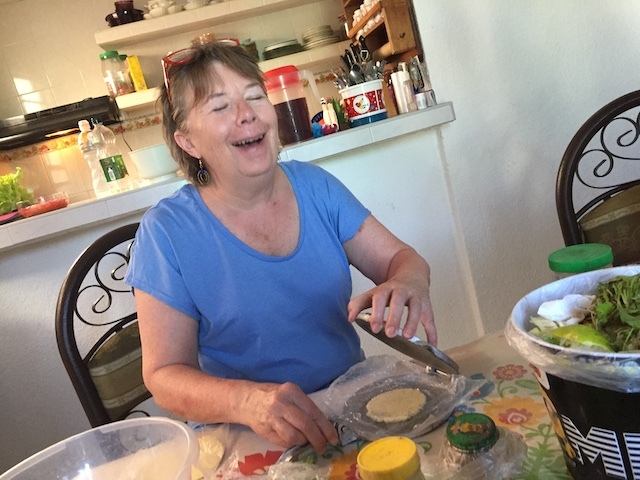 She had a good laugh about the first tortilla she made which was very small. But eventually she got the hang of it. 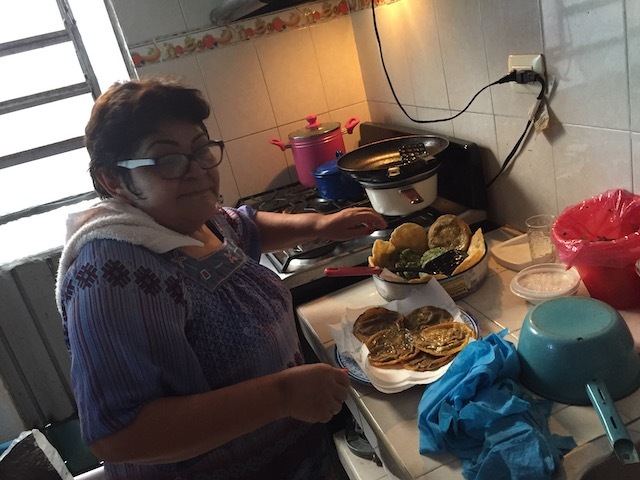 Bertha fried the tortillas and they puffed up and looked light and beautiful. 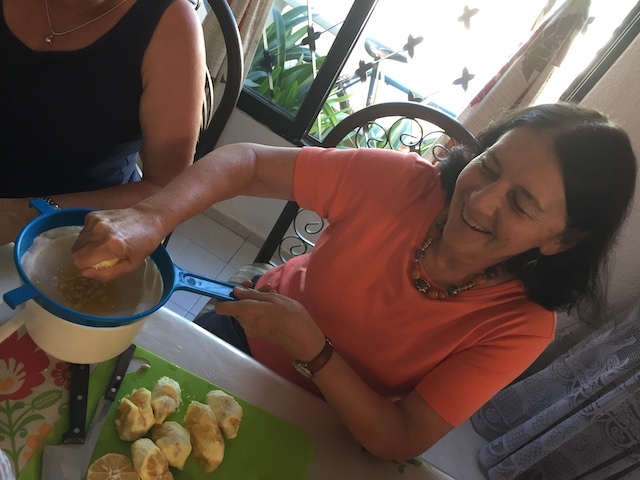 Now the chaya I had chopped was added to more tortilla dough and Kaaren and Deb patted it into little round cakes and then…….. while Edgar and I were pulling apart the chicken which had been roasted in a red achiote paste Bertha finished frying up the three different kinds of tortillas we had made. 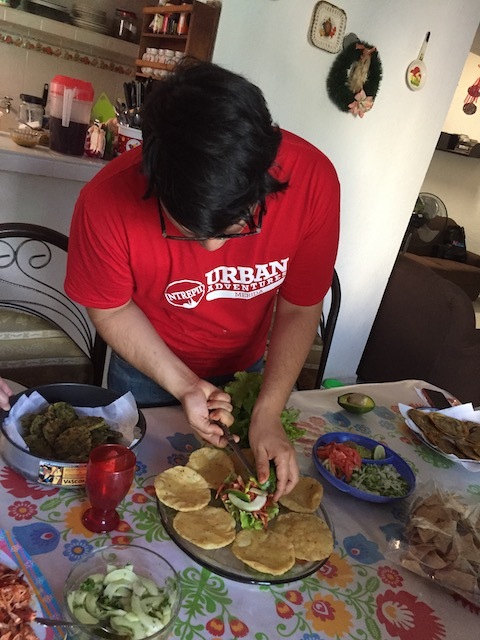 Edgar demonstrated how to put together the salbutes and panuchos – first a lettuce leaf, then some pulled chicken baked in achiote paste, then a few slices of marinated cucumber, some tomato and finally a couple of slices of avocado. We were quick learners and soon the plates looked like this. 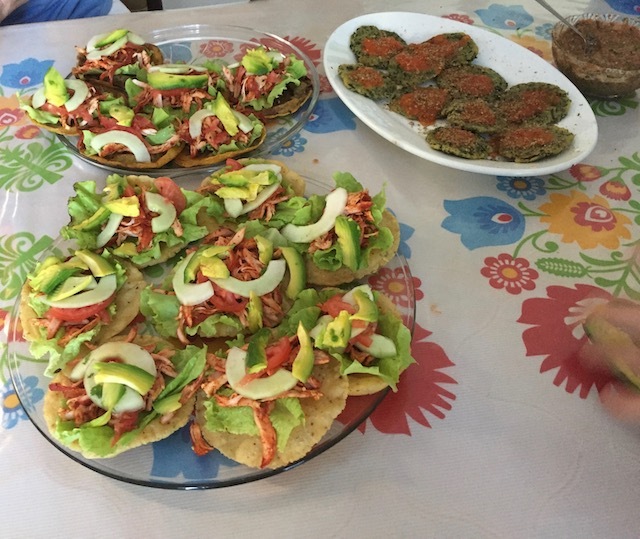 Salbutes in front, panuchos behind and to the right of the panuchos the chaya tortillas with tomato paste and up in the corner of the picture a nutty dip for tortilla chips made with tomato sauce and pumpkin seed powder. Edgar was pleased with how well we had done under his instruction. By the way throughout the experience we were drinking a delicious iced tea made from dried hibiscus flowers. 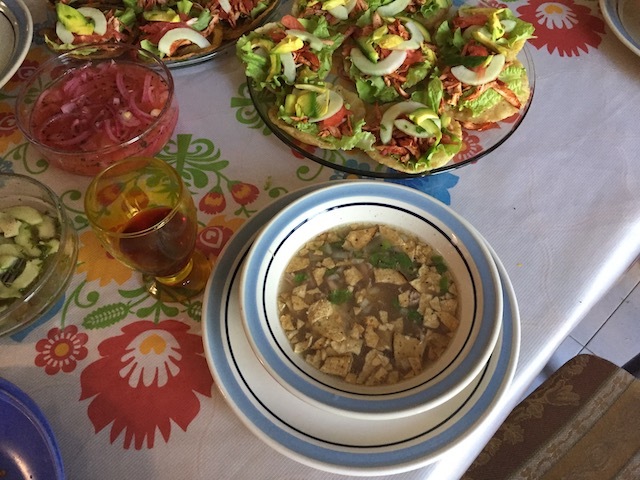 Our meal started with some wonderful soup de lima and then…….. we enjoyed all the other dishes! 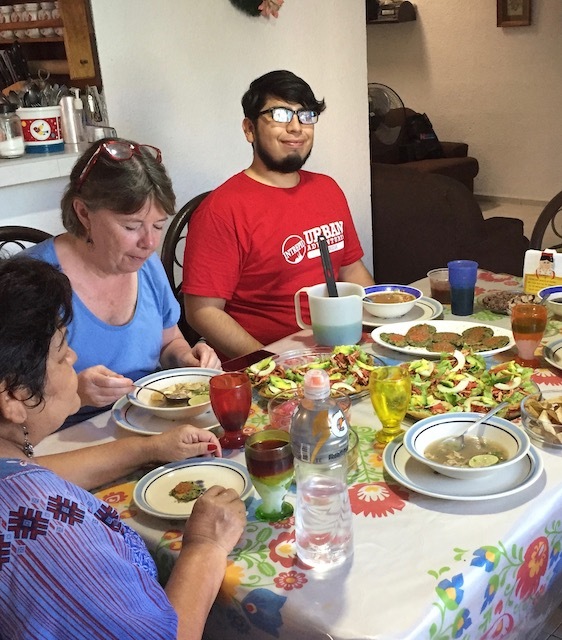 Before we left Bertha had her grandson take a picture of us and asked us to write our names and some comments about our meal in her notebook which was full of anecdotes and accolades from folks from all over the world who had cooked at Bertha’s house. 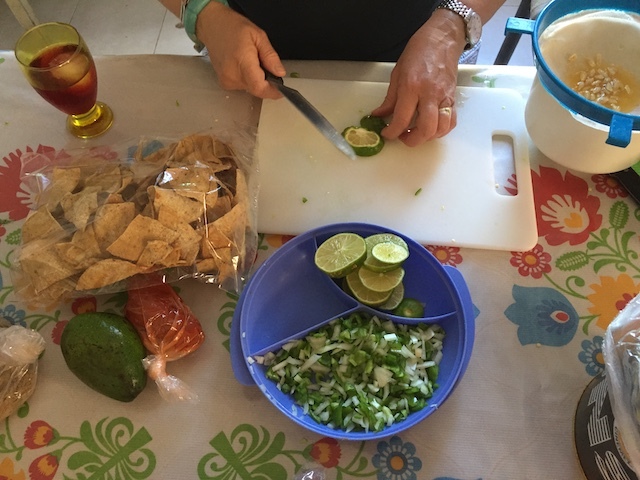 We were full and tired and ready to head home but we’d had a great Mexican cooking adventure we wouldn’t forget!